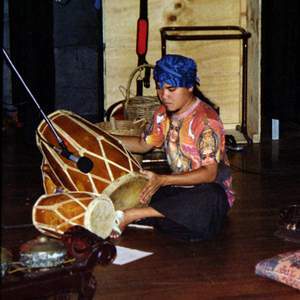 Sundanese musician Efiq Zulfiqar visited Australia as AIAA NSW North Coast Musician-in-Residence for 3 months during 2002 with a further 3 months of extension activities in Southern Queensland, Sydney and Nth NSW until Feb 2003. This project was supported by the Australia Indonesia Institute and Garuda Indonesia. While in Australia, Efiq collaborated with Australian musicians and experienced Australian culture while sharing Sundanese and Indonesian music with the Australian community. Efiq has now returned to Bandung, West Java where he is presently rehearsing with fabulous percussion band Sambasunda in preparation for their next tour of Europe commencing in June 2003. Efiq is well known in Indonesia as a skilled musician, playing Gamelan, kendang, suling, flute, electric bass, percussion, and more, as well as assuming the role of composer and arranger in collaborations. While in Australia Efiq created a recording of new compositions with North Coast musician Tarshito which is now available for sale. Efiq also had the opportunity to attend the Schools Spectacular in Sydney, Refugee Week at Lismore Art Gallery, Gallery Tour of Byron Shire, Asia Pacific Triennial at Queensland Art Gallery, meeting with Australian artists and also other Indonesian visiting artists such as Heri Dono and Aris Prabawa from Jogjakarta. While in Australia, AIAA has co-ordinated a wide range of cultural exchange activities for Efiq. These include gamelan, drumming and bamboo flute classes, as well as recording and performing with local musicians.